In May, the telephone phone call he had hoped for was received by Samford University junior and ROTC cadet Skyler Graham. Graham was told he was invited to take part in a new exchange program between the U.S. Air Force Academy in Colorado Springs, Colorado, and Air Force ROTC. This invitation was extended to only six cadets nationally. It will allow Graham to attend the Air Force Academy for the entire fall semester of 2015. “I really couldn’t believe that this kind of this opportunity had presented itself,” Graham said. 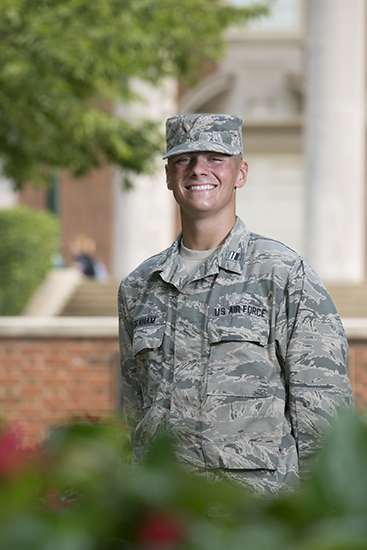 Graham was originally selected as a candidate for this opportunity in February 2014 because of his high grade point average, excellent physical fitness scores, positive moral character, and his natural ability to lead others, according to Travis Dixon, commander of Samford’s ROTC detachment. The exchange program selected cadets from more than 2,000 possible candidates representing 145 ROTC detachments across the United States. After an extensive review of performance standards and requirements, Air Force ROTC headquarters announced recently that Graham had been selected for this prestigious program. He is excited for the experience and stated that the exchange program "is an opportunity of a lifetime." This is the first time there has been an exchange program between the Air Force Academy and Air Force ROTC. Therefore, Graham is not only representing Samford University, but also all ROTC cadets across the nation as he is immersed in the culture of the U.S. Air Force Academy. During the program, Graham will attend all of his classes at the Academy, will take their fitness tests, be placed in a leadership position, play intramural sports and conduct their military training. Dixon said the hope is that when Graham returns to Samford, he will be equipped to help incorporate training techniques and lessons learned into Samford's Air Force ROTC program. In addition to his admission in the exchange program, Graham also was recently awarded distinguished graduate honors at Field Training. Along with 307 other cadets from across the U.S., Graham went through a 28-day leadership evaluation encampment where cadets were tested physically, mentally and emotionally to ensure they are capable of leading in stressful environments. Graham finished in the top 10 percent of cadets, earning him the distinguished graduate honors. This is the second year a Samford Air Force ROTC cadet has been selected for a prestigious national program. In 2014, Cadet Kristen Montgomery was selected as an intern with the Air Force Research Lab in Rome, New York, and was also selected to participate as a general officer in a war-gaming scenario at Maxwell Air Force Base near Montgomery, Alabama. John Dickson is a news and feature writer in the Office of Marketing and Communication.